A photo posted Friday on Facebook by State Senate Majority Leader Bob Duff (D-25). “The #StopandShop parking lot virtually empty today on Main Ave in Norwalk. Lots of customers leaving in solidarity once they saw strike signs,” Duff wrote. Updated, 7 p.m.: Photo swapped; 1:39 p.m: Stop & Shop statement; 10:17 a.m.: Information added. 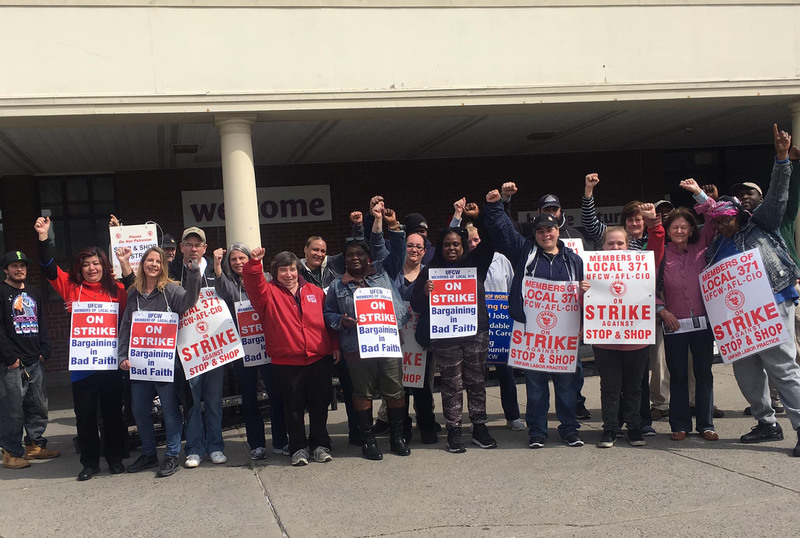 NORWALK, Conn. – Norwalk Stop & Shop workers joined a New England-area strike Thursday. “Stop & Shop is not being too nice,” a worker told a woman approaching the store Thursday afternoon. Striking employees asked approaching customers to shop elsewhere, and many agreed. Some shoppers were told that they could enter the store and get groceries, but nobody would be inside to help them. The strike began at 1 p.m., workers said. “Hopefully this is short-lived,” one said. The Connecticut AFL-CIO (American Federation of Labor and Congress of Industrial Organizations) states that 31,000 Stop & Shop workers across Connecticut, Massachusetts, and Rhode Island have gone on strike. “This is not the time to ask for concessions,” the union said, noting that Stop & Shop’s parent company reported more than $2 billion in profits last year. The contract between Stop & Shop and five United Food and Commercial Workers local unions expired on Feb. 25, the CT Post reports. Stop & Shop is offering a wage package that “would make this among the best UFCW retail contracts in the country” and allows associates to keep their premiums for working on Sunday, the statement says. Employees would pay $4 a week for health insurance instead of $2 a week, and that is well below the national average, according to Stop & Shop. It’s great to see these employees organizing. I’ve been shopping at the Main Avenue store for almost 20 years, and some wonderful people have been longtime workers there. Hope this comes to a good resolution for them soon. I’m going to miss shopping there. Hope management comes to their senses soon so I can go back. The 1 sided bias in reporting is absolutely astounding…unbelievable. The open market, what a beautiful thing: workers are free to come and go, they can strike, join another firm, work wherever and whenever, take your pick. Readers (and viewers) can find the other side of the story from some very, very brief and basic searches, see below. My favorite and why I might not buy my grapes etc. at Stop and Shop? This gem from below: Can you imagine having an annual deductible of $200 – $300? That is insanely low. Go back and read that. Anyone else ever seen it THAT LOW?! Would be curious to see the full plan including premium. How about $7 per hour strike pay to not work vs. $12 per hour to work?! Huh? I guess the union dues are finally coming back to help the worker who chose to strike. • Increased company contributions to the UFCW’s defined benefit pension fund for current full- and vested part-time associates – a rare benefit in the New England food retail industry. The Stop & Shop statement you linked to was issued Friday. This story was written on Thursday. Nancy added the grocer’s statement today. i find it amazing they can stand at the front door and harass people that need to shop. They are protesting bullying. Is this any different? @Ron Morris- I guess you dont need any new tires at like say Townfair Tires cause your $20 an hour cost would be passed right on you. Is this the same Kevin Kane from the Norwalk Bike / Walk Gestapo? That’s a good look for you, dude. Rail against your neighbor’s desire to earn a decent living to support a family and frolic around wasting taxpayer funds by throwing up signs all over town. Let me guess your bike cost more than what an average Stop & Shop employee earns in a few months. And that’s fair right because you had the same equal opportunity and upbringing as everyone else in life, especially those working at the place where you purchase groceries? Tysen, there hasn’t been any bullying. All the workers are asking is to support the strike and shop elsewhere. These are the workers that keep this store running smoothly day in and day out. You wouldn’t be able to purchase anything here without these hard working union employees. Not asking for much. Just a fair contract going forward and not a settlement with a loss of wages and health benefits. A company that profits 2 billion dollars annually is showing what they think of their employees with these new contract proposals.